Charles Eames always retained an affinity to the world as seen through the eyes of the child. The first furniture designs to be commercialized were the plywood Children’s furniture range which were sold in modest numbers following their design in 1945. Many of the films that Charles produced were to utilize toys and models and animations too. But during the early 1950’s Charles fulfilled the personal ambition of creating, marketing and selling a small number of Eames toys and games, once again demonstrating his ability to design and produce in so many varying media. The toys of Charles Eames all had one thing in common, they were made to inspire the mind of the child, to bring imagination and creativity to the fore. When we think of the video game dominated present, it is refreshing to see how the toys intelligently encouraged free thinking, building, and display. It would not be far from the truth to describe the Eames toys as being the best kept secret of a world-renowned design portfolio. The original Eames Office teamed up with the toy maker Tigrett enterprises which was based in Jackon, Tennessee. Tigrett had produced some of the leading toys of the time including the Santa Pots, Albert, the Golden Sonic and the Zoomeray Pistols. 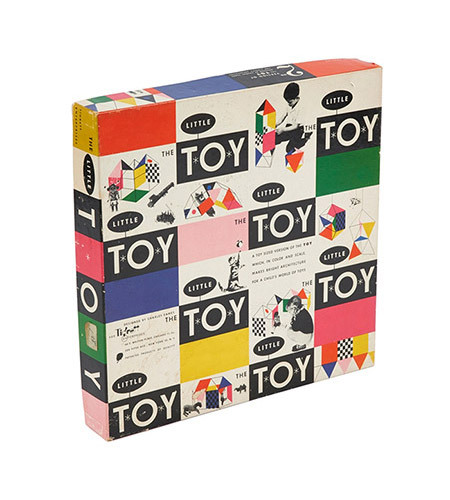 Tigretts choice of toys and packaging designs encapsulated the space age theme of the times and their colorful and enticing appearance were a perfect fit for the toys of Charles Eames. Charles would entitle his first design simply ‘The Toy’ but it was in fact much more than that. The beautifully designed hexagonal box opened at the ends and the contents would reveal a selection of colored panels, sticks, ties and the instructions. 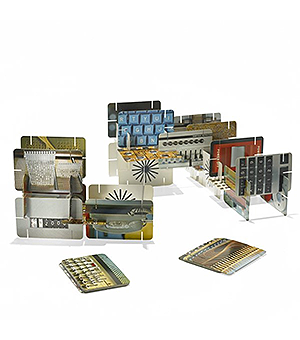 The purpose of this Eames game was to construct any combination of the colored panels to create a den, set, building or sculpture (anything). The instructions provided some examples of what could be made with The Toy but its purpose was very much to encourage the player to make their own. Multiple packs of the game could be used to create even larger constructions and sets. 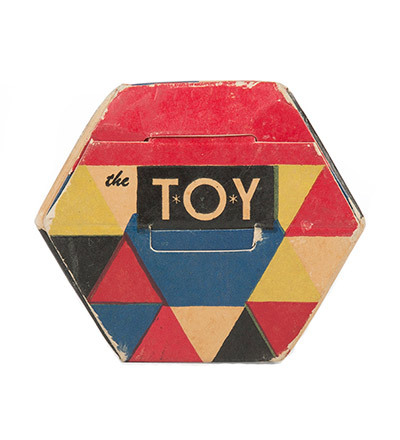 A year or so after the success of The Toy Charles and the Eames Office produced a desktop version of the same game entitled The Little Toy. The idea behind this miniaturized version was that, although the principal of the game was the same as the bigger version, the resulting constructions could be used with other toys. 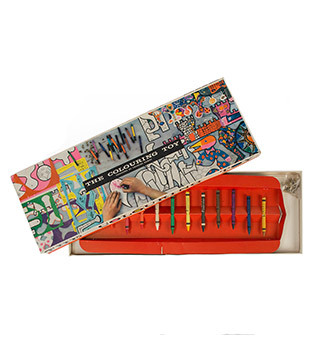 The Coloring Toy followed in the same vain with the materials and concept provided for the user to produce and create using their own imagination. Multiple cut outs of varying shapes could be colored with the supplied crayons and then pinned together to make any number of possible shapes, and puppets. The very nature of The Toy, Little Toy and Coloring Toy meant that materials were used and essentially consumed, used till broken or lost over time. 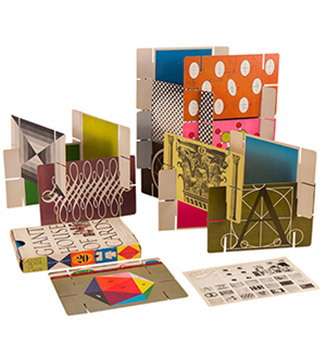 This makes finding original versions of the Eames toys today extremely difficult as you would basically have to discover those that have never been used or used so sparingly that everything still exists within the box. 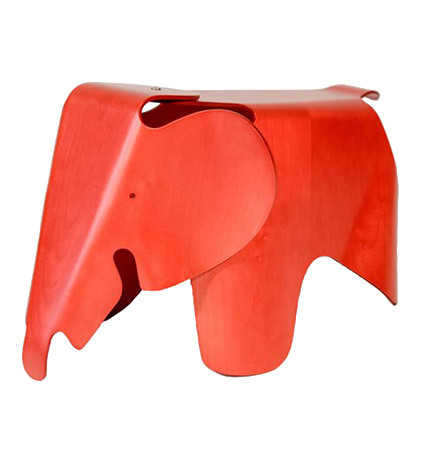 For this reason, the original toys of Charles Eames can fetch high auction prices today. 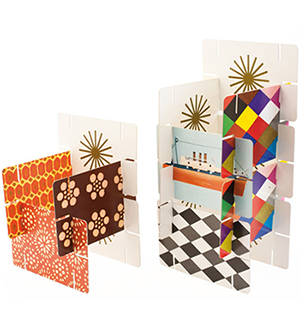 The most famous Eames toy designed however was likely the House of Cards, a deck of pictured or patterned cards with 2 pre-cut slots into each of their four sides. The concept was, once again, down to the player to construct any shape, tower or building using the slots of the cards to fit together. The design was very popular and whilst Charles’ other toys had a short market life, the House of Cards is still available today. A larger version was also released called the Giant House of Cards and IBM borrowed the concept too in producing a Computer House of Cards for visitors of their expo in 1970.